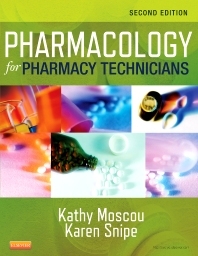 NEW REVIEW -- MOSCOU / Pharmacology for Pharmacy Technicians. Elsevier, 2008, $62.95. Imprint: Mosby. ISBN: 978-0-323-04720-3, 759 pages, soft cover. This book covers the pharmacology and pathophysiology of the human body system by system and the medications used to treat each system's disorders. It is systematic and compelling to read. This book is written for students as well as their instructors. It also can be used as one of the references in any pharmacy's library. From the history of medicine and medication discovery and approval by the FDA to drug administration, absorption and pharmacokinetics, and pharmacodynamics of each medication, this book discusses the pharmacology and pathophysiology of human body systems (cardiovascular, gastrointestinal, respiratory, endocrine, autonomic nervous, etc.). The book has many excellent features: it is appropriately and accurately illustrated; important notes pop up in the margins as quick reminders; pertinent forms are included (such as the FDA MedWatch); each chapter is followed by a short set of questions addressing the chapter's high points. The book includes a user-friendly CD-ROM full of quiz questions and self exams as well as pill pictures of high quality resolution. The index quickly takes the reader to the needed subject page. As a practicing pharmacist, I would like to see future editions make a tie-in to the job description of a pharmacy technician. Also, a chapter on how to prioritize the dispensing of various medications would be beneficial; e.g. dispensing an intravenous medication used for a cardiac condition would have priority over dispensing a levothyroxin tablet for hypothyroidism. This is an excellent reference that I plan to keep in our pharmacy library. I am looking forward to the next edition, hopefully incorporating my suggestions, as well as those of others.